Very off topic this one (please forgive me Nathan). Today we say thanks to the government ( Taxman ) for leaving us some money. 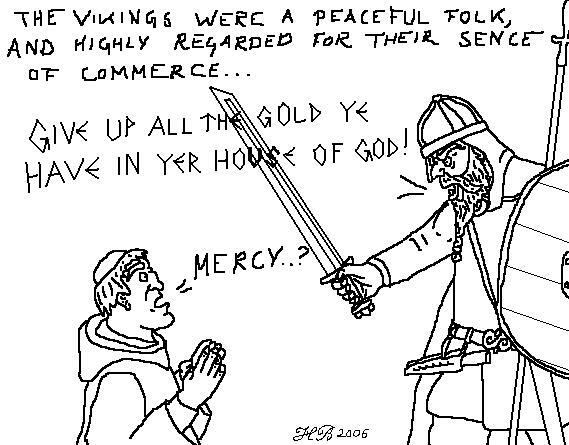 I'd rather just give my gold to the Vikings. ahhhhhh i am insulted, i will protest and burn your country! I am even more insulted, so I will burn some herring! But its not like the Vikings where any more brutal or vicious then the later european warriors under the dualistic banner of christendom. One might do a similar drawing with a Templar and a citicen of any coastal-town around Jerusalem..
Hehe Thanks for the comments!